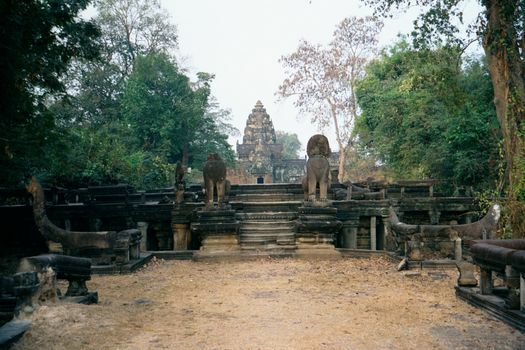 Neak Pean wasn't the only island at Angkor. 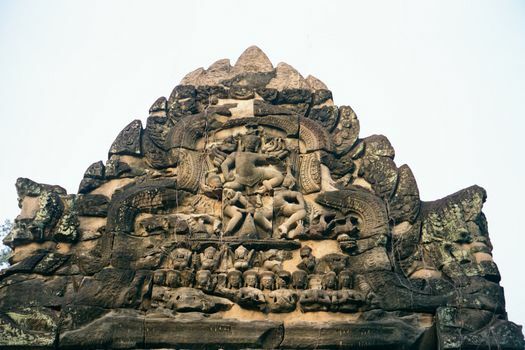 South of the Jayatataka or North Baray was the much larger and older East Baray. Built about 900, it too was rectangular, but it measured about one mile north-south by four miles east-west. 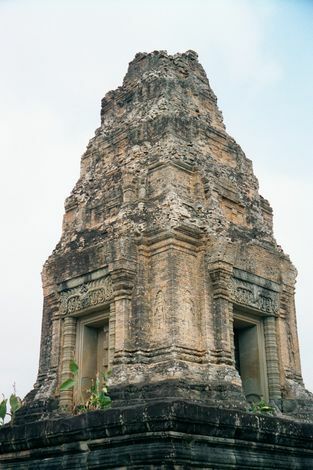 At its center was the island temple known as the East Mebon. 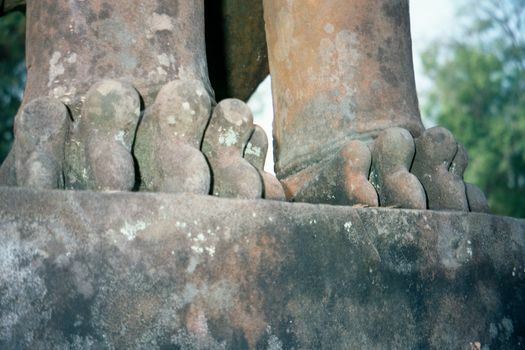 (On the west side of Angkor Thom, there's a West Baray with a West Mebon, now only vestigial.) 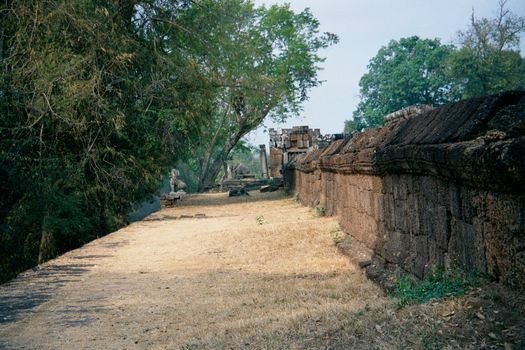 To the east of the East Baray, meanwhile, and connected to it by a causeway, was a city known as Banteay Samre, "the fortress of the Samre." Most visitors don't get to it: they're too fatigued. That's good news for anyone wanting to escape the crowds. The East Baray was only a few meters deep, which raises questions about whether it was utilitarian or symbolic. Today, it's bone dry and cultivated, so you have to use your imagination to picture water lapping around the laterite platform of East Mebon. 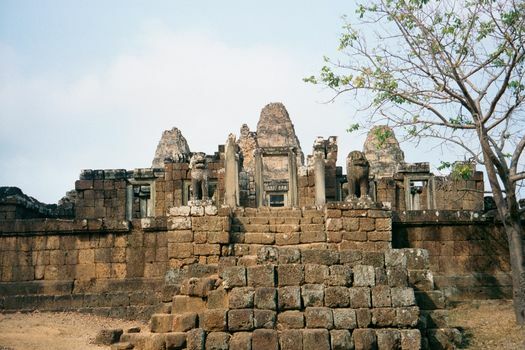 Here's the island seen from the east and showing East Mebon's nested tiers with towers on the highest platform. 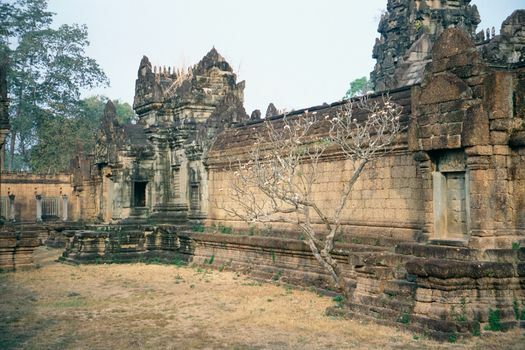 Except for the towers of the Prasat Kravan, this is the oldest structure we've seen yet. 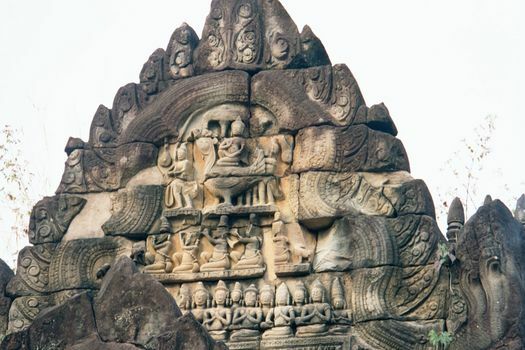 It was built about 950 by Rajendravarman, whose capital, now called Preah Rup, lies due south of here, on the southern shore of the East Baray. 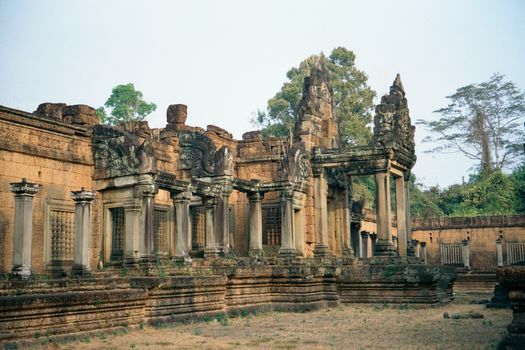 The only part of it that survives is its temple-mountain, which looks much like East Mebon but rises higher. 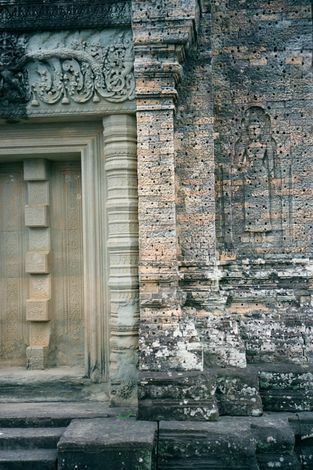 The East Mebon's towers are marked, as is so often the case at Angkor, by four doors, of which only the east (shown here on the right) leads inside; the others are false. Here's one of the blocked doors. The holes in the brickwork on the right are original, intended to anchor the stucco that once covered the brick. 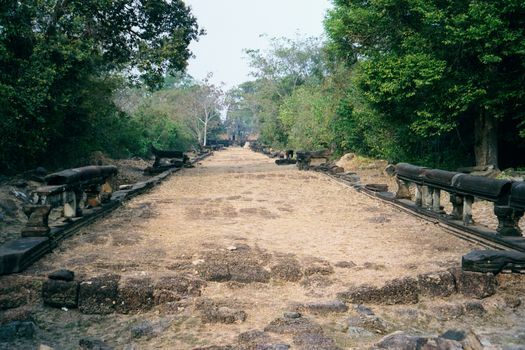 We've moved east about three miles and are looking west on the causeway that leads to Banteay Samre. You recognize the naga balustrade. Ahead, you may be able to make out some stairs. Approach! Here they are, with the temple's lone lotus tower rising between two lions. 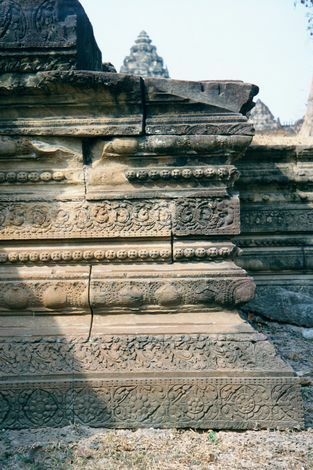 Floral decoration covers even the base of the causeway. Inside the first wall, which is visible on the right. In the center and left is the second enclosure, with elaborate pediments. Note the window at the left, with stone spindles. A close-up of this typical feature, imitative of wood. Another view of the outer wall, on the left, and the inner. 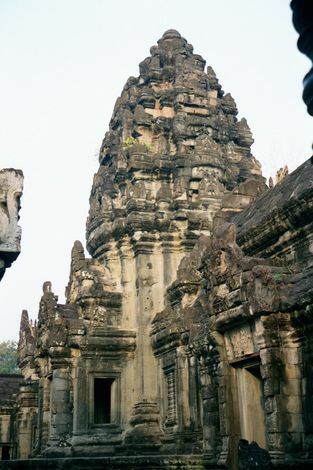 The structure was built about 1100 and so is contemporary with Angkor Wat. 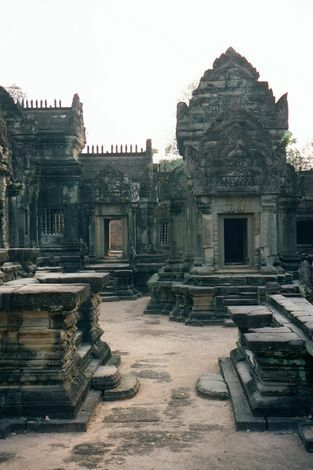 It was built not by Suryavarman II, however, but probably by one of his nobles. 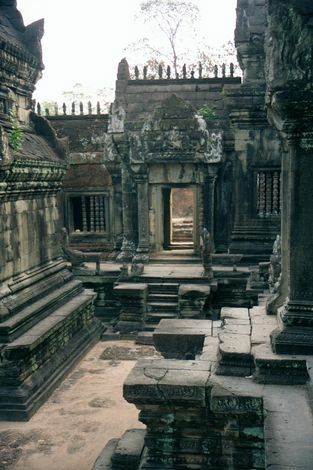 Certainly it's far smaller than Angkor Wat: the outer wall here measures 77 by 83 meters; the inner, 44 by 38. Inside the inner wall is this towered shrine to Vishnu, crowded by surrounding buildings. Again, the pediments are profusely decorated. If they look in comparatively good shape, that's because the whole temple was reconstructed by a French archaeologist, Maurice Glaize. 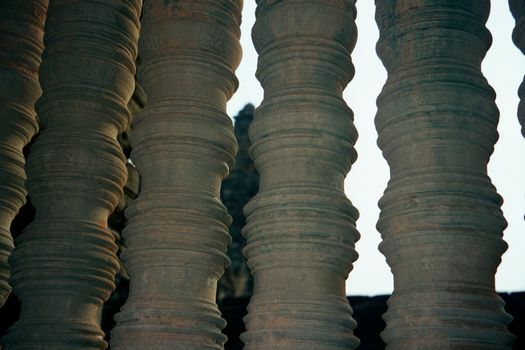 Best for last: here's the real marvel of Banteay Samre. It's an inner moat, now dry. Water once surrounded the shrine. In a hot climate like this, the effect would have been tremendous. The moat appears to have been not only for the eyes but the skin: the only way into the central shrine is by descending into the pool, wading through the moat, then ascending at the sanctuary.